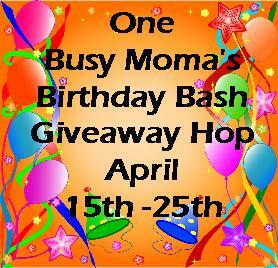 Welcome to One Busy Moma's Birthday Bash Giveaway Hop!! 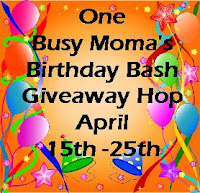 21 Bloggers have teamed up together to help Sheri over at One Busy Moma celebrate her birthday and bring you some amazing giveaways. Each Blogger is hosting their own giveaway(s) with prizes worth $15 or more. There is also a Grand Prize Giveaway that you can enter to win a prize package worth $50!! So have some fun hopping around to all the different blogs after you have checked out our giveaway below. Scroll to the bottom to find the linky with other blogs to check out to enter to win some great prizes! I am giving away 2 prizes.